Learn Slovenian Online Quickly and Efficiently! Learn Slovenian at your own pace with our self-guided online course. Including 30 comprehensive lessons to get you speaking in no time. Learn Slovenian through one-on-one classes with native Slovene and experienced teacher. Valentina conducts classes via Skype, or in person if you are in Ljubljana. 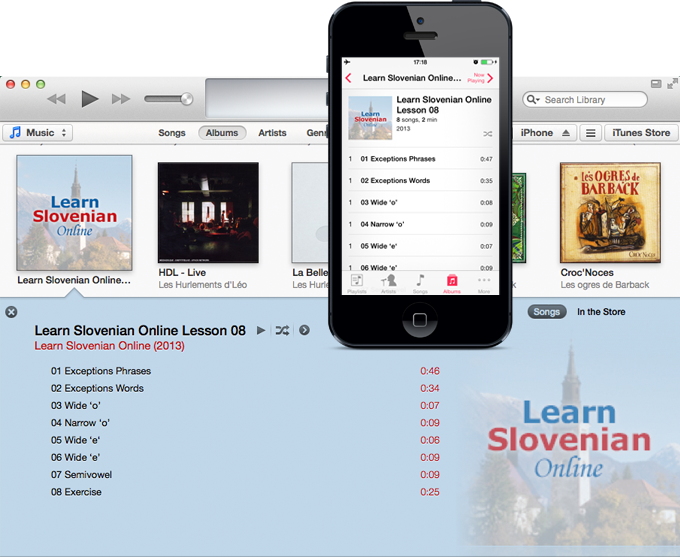 The Learn Slovenian Online program provides you with everything you need to learn Slovenian. It has been designed with a focus on practical language use, so you can start using what you are learning right from the start. Purchasing the course means you receive lifetime access to the learning materials, and benefit from all future improvements and updates. Our latest update features a Downloads section, from where you can download the course audio files for learning on the go. All audio is recorded by a native Slovenian speaker and files can be downloaded so you can maximise your learning time on the go. The Mp3 files can be played on your computer, smart phone, or Mp3 device. Learn to speak confidently with over 30 comprehensive lessons. Learn effectively with the help of over 200 audio recordings performed by a native Slovenian speaker. Understand basic Slovenian grammar in only 12 sentences. Who is Learn Slovenian Online for? Travellers and tourists, for both business and leisure. Foreign exchange and Erasmus students. The first six lessons lay some ground work. The aim is to get you started quickly, and to build momentum early on to help motivate you through the tougher, more grammar intense lessons towards the end of the program. After getting warmed up and acquainted with the language, you jump right into dialogue, followed by useful phrases, organised by situation. Lastly, comes everyone’s favourite topic, grammar! By this stage in the program you will have built up an impressive amount of phrases and vocabulary. This foundation will help in understanding Slovenian grammar and enable you to unlock what you already know, to start expressing yourself by constructing your own sentences and questions. The end of several lessons feature exercises to test your knowledge. The majority of sections also feature a selection of digital flash cards, for use with Anki. Anki is a free program which allows you to test yourself using these digital flash cards and works on the basis of spaced-repetition learning, a technique which has been shown to significantly increase memory retention. Learn more from our blog post, Using Anki Flashcards with Learn Slovenian Online. You will be taken directly to the free lesson. We will add you to our “I’m Interested” list and email you no more than once a month with LSO news. You’re email address will never be shared and you can opt-out easily. Or, Purchase the program to get full access now.